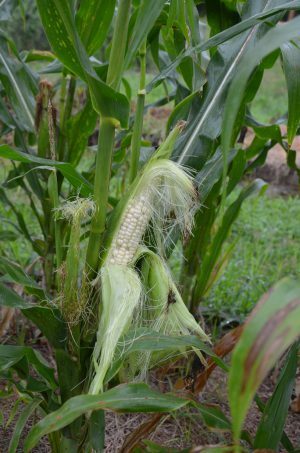 This silver queen sweet corn in the UF/IFAS Wakulla County Extension demonstration garden is ready to pick. The recent rains have helped it reach peak maturity. One thing is certain, the recent rains are making the grass and most other plants grow. Thankfully the conversations about drought have been silenced for the time being and everything is green. In the local home gardens a member of the grass family is responding positively to all the moisture from above. Sweet corn in many gardens is now nearing peak ripeness and ready for any of the many preparation options for human consumption. Zea mays, as this popular vegetable is botanically known, is producing ears full of juicy kernels. Wakulla County gardeners who were fortunate enough to plant immediately after the late March frost are now getting ready for harvesting. This North American native has been a consistent addition to the menu for over 10,000 years by some estimates. Ethno-botanist believe the early inhabitants of Mexico began deliberately cultivating the wild corn plants to secure a stable source of food. Evidence indicates the cultivation of this crop began to move to new locations about 4,500 years ago. The easy to preserve and transport grain became a staple crop through much of Meso-America, long before Spanish explorers arrive. During the Age of Exploration this grain was spread to Europe and points beyond. Today it is the most widely grown grain on the planet. Sweet corn, the popular garden and commercial crop, is the product of selective breeding. For centuries plant breeders have cross pollinated all corn varieties in the hopes of developing cultivars with the most useful and desired traits. In the case of sweet corn, it is the sweet juicy kernels with the relatively high sugar contents. This genetic variation in the species was first noted in the late 18th century. The sugar content of sweet corn varieties or cultivars can be over ten times higher than in field corn cultivars. Field corn is used primarily for livestock feed, and dry products like grits and corn meal. Cultivation of both sweet and field corn is exactly the same. Seed are planted about half an inch deep in spring after the danger of frost has passed. Soils rich in nutrients and organic matter tend to provide better yields, but even sandy ground so common in Wakulla County, can produce well if supplemental nutrients are added. As with all members of the grass family of plants, poaceae, supplemental nitrogen is required. As with any horticultural or gardening effort, soil testing is strongly recommended. Excess nutrients frequently end up in water bodies or the aquafer which is detrimental to everyone. Sweet corn is harvested much sooner than field corn. A good rule of thumb for sweet corn is 90 days, depending on the weather and a few other factors. At harvest sweet corn’s kernels are plump and moist with a glossy sheen. Field corn will stay on the stalk for 180 days or more and have dented kernels with a dull appearance. Any corn is subject to attack by an assortment of insects, especially caterpillars and grasshoppers. Additionally, deer are inclined to make nocturnal visits to snack on the corn plants and may eat it to the ground. The ample rain is making the grass grow faster, requiring more frequent mowing. Extra work aside, the rain is also producing some very good sweet corn.